Eastern Coachworks was a much loved body builder of Britain’s buses. The factory situated in Lowestoft, Suffolk was closed in 1987. Over the weekend of the 16th and 17th June 2012 the East Anglia Transport Museum at Carlton Colville staged an event to mark 25 years since its closure. The independent transport videos cameras were on hand to record the occasion. 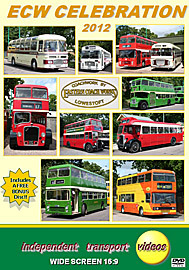 A large number of preserved ECW bodied buses were invited to take part in the event and these vehicles turned up from many parts of the United Kingdom displaying an array of liveries of companies that have now been consigned to the history books. The East Anglia Transport Museum is home to an interesting collection of trams and trolleybuses, as well as some motorbuses, and it is where our filming starts on Saturday 16th. The makeshift bus station becomes a very busy place, with buses arriving and departing on routes to places such as Beccles and Lowestoft town centre. We move into the Museum grounds to film some of the buses that are being exhibited, but not running in service. It’s now time to sample the ECW products, with a ride to Beccles on board an ECW bodied Bristol RELL6G, which formally ran in service with Eastern National, 1516 (FWC 439H). Following closely behind is another RE, this time a RESL6G from the Eastern Counties fleet, RS658 (KVF 658E) also sporting an ECW body. You get the best of both worlds here as we hear the sounds of 1516 and film RS658 on our way to Beccles! Back at the Museum we film more of the action before the buses get ready for the parade to the former factory site. Our cameras travel on the leading vehicle, former Lowestoft Corporation AEC Regent II, 21 (GBJ 192) with ECW H56R bodywork. What a sight this is, as the convoy of some 26 ECW bodied buses and coaches make their way through Lowestoft on a sunny June summer’s evening. From here the parade moves onto Gunton Cliffs, where our cameras are on hand to film the arrival of the buses – quite a spectacle! Our bus for the return to the Museum is former Hants & Dorset, ECW bodied Bristol K6A, TD895 (HLJ 44). Our Sunday morning filming starts at the ‘bus station’ and records all of the departures and arrivals with many more different vehicles appearing for your enjoyment. Our final ride out is on a former Lincolnshire R.C.C. Bristol VRTSL6G. 1904 (JVL 619H) features the flat screen body associated with the early Bristol VRs. We journey out to Gunton Cliffs on this superbly restored vehicle. Our filming is rounded off at the Museum ‘bus station’ - a superb weekend and fitting tribute to these well loved buses. We include a bonus disc with footage filmed in 2007 of three ECW bodied buses taken out from the Museum. The buses are ECOC LFL57 (557 BNG) and Lowestoft Corporation AEC Swift 4 (YRT 898H) and AEC Regent 21 (GBJ 192). Enjoy!! Duration : 101 minutes (approx).